WP_Mock: ( https://github.com/10up/wp_mock ) is an API mocking framework that can be used for unit testing WordPress Plugins. This tutorial is a complete beginner guide to add and integrate WP_Mock mocking framework to your WordPress Plugin. WP_Mock uses Mockery PHP mock object framework for unit testing WordPress plugins. This is how to properly implement unit test inside WordPress plugins and can be considered as one of the best practices. If you are already familiar with mocking and unit testing, you can skip the introduction below and proceed directly to requirements and steps section. It allows developer to “mock” test data, objects, properties, classes and methods to be used during the testing. In short, you don’t need to rely on the WordPress core environment to be loaded just test your plugin. This minimize test time, complexity and improve efficiency of your tests. Other synonyms of “mock” as used with testing includes “fake”, “staged”, “planned” or “simulate”. Since there is no loading of WordPress environment during this testing. It does not actually use real database or actual $wpdb object methods to read and transact testing data from database tables. Again this is mocked or simulated when using WP_Mock and Mockery. All WordPress core functions are mocked as well. A common example is if you are getting post from a database using get_post() or retrieving users using get_users(). You are not actually calling these functions since WordPress is not loaded when using WP_Mock. You define and set this in advance before actually calling one of your plugin method that you need to test. Since dependencies are mocked except with the method you are testing, you can be confident that the test pass or fail entirely depends on the “unit” being tested and not with the other dependencies. 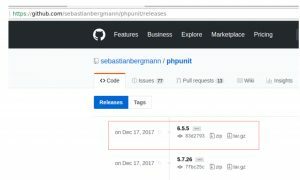 You will use git to actually install your plugin WP_Mock library and its dependencies from GitHub. Composer is used to install third party dependencies that is needed by WP_Mock such as Mockery, phpunit library, etc. You should be connected to the Internet when you integrate WP_Mock with your plugin. This is required to fetch all required third party libraries. You have a plugin folder called “wp-mock-test-demo“. Under this main plugin folder, you will find the main plugin file wp-mock-test-demo.php and the include folder where the plugin classes are stored. The above structure is common to many plugin nowadays. Again that’s an example only and its simplified for the sake of this tutorial. Now you have all the requirements set, below are the steps to integrate WP_Mock to the above example plugin. name, description, authors should be self-explanatory. Just edit them and put your own values there. Under autoload -> classmap is where you will put the path of your plugin classes that you need to test. Example classmap has a value of includes/ because this is where the sample plugin classes are located. Composer will autoload these classes automatically for testing with phpunit. * Autoload the composer items. The purpose of this script is to auto load the composer items that will be using for your testing. 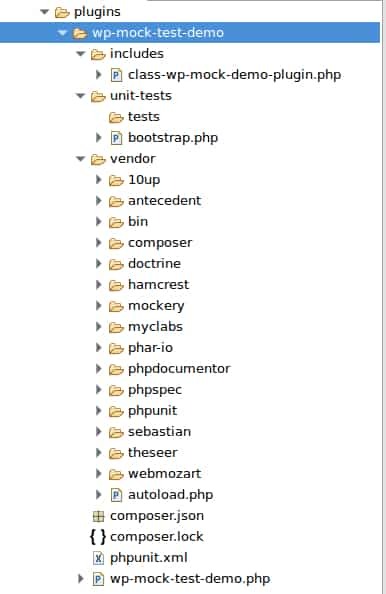 Your bootstrap.php should be found in: /wp-content/plugins/wp-mock-test-demo/unit-tests/. The script vendor/autoload.php will be automatically created when you finally install the test dependencies with composer later on. Also according to your phpunit.xml, you should be creating a tests directory under the unit-tests directory. So go ahead and create this tests directory. This is where you will put your unit test files later on. The installation can take a while depending on your Internet connection. Wait until all is completed. This installation processes creates new directory called “vendor” and there are several sub-directories and files under it. Now you are all set. This is how the demo plugin structure would look like after completing the above integration and installation of third party libraries for using with your tests. This is your default WP_Mock test template file. Every time your add a new test file, start with this template. It consists of adding a basic setup and teardown of WP_Mock test. //Now let's assert that the filtered title is one we expected.